I first heard about Pushing the Limits by Katie McGarry earlier this year. Harlequin Teen must’ve done a huge amount of behind the scenes work because nearly every book blog I subscribe to in Google Reader was reviewing it. The marketing for Pushing the Limits felt forced and rather off because it construed the novel to be different than was it actually was. The title of the novel, paired with the cover image, and the blurb on the back (see below) did not make Pushing the Limits very enticing. It felt like a younger cousin to Harlequin’s adult romances. Marketing of the novel aside, Pushing the Limits is a charming novel about a girl named Echo who’s trying to figure out what happened one night, so severe that it made her forget the whole day and Noah, an equally troubled boy who is trying to put his family back together. Needless to say, Noah and Echo end up together as a couple but it’s the journey there and how they help each other that makes Pushing the Limits an interesting read. Echo dislikes her parents, her distant and overbearing father and her stepmother, who Echo believes broke up her parents’ marriage. Echo’s forced to attend therapy sessions to help her discover for herself what happened that night. Noah is a stoner and a foster kid, ever since his parents died in a fire. Despite his reputation as the “bad boy”, Noah is trying to get his family back together since his younger brothers were placed into foster homes. Initially assigned to be tutor and students, Noah and Echo discover that they can help each other come to terms with their lives. 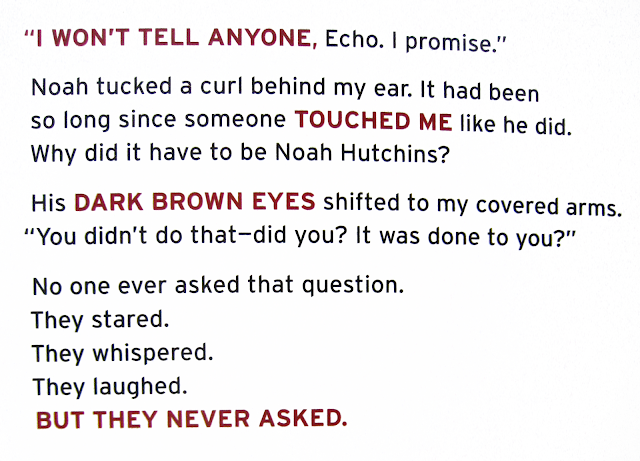 Switching between the perspectives of Echo and Noah, Pushing the Limits was intriguing since the characters were so different and flawed from characters that I usually read about yet I connected with them a lot more than I thought would be possible. The characters had images of that they thought were right, but their perceptions weren’t the truth. There were numerous twists and turns, all surprising but none too random. Ultimately, Pushing the Limits is about two characters who try to overcome their pasts to create different and new futures. It’s complex, with its inclusion of themes such as abuse, friendship, memory loss, truth and more. It was surprising that Pushing the Limits could pack such a big punch.